“When asked whether the federal government could develop AI in-house, Susan Hennessey, a Brookings fellow and executive editor of Lawfare, said agencies likely won’t have to resort to that,” writes Leonard. Government agencies and large private organizations ranging from Homeland Security to private intelligence firms require the knowledge and skills of an acquisition manager to run efficiently. Acquisition experts facilitate the procurement of equipment, services, weapons, and various other office or technical supplies that their agencies need to accomplish their work. Students pursuing an online emergency management degree may find a career in acquisition management to be an attractive and exciting field. But what exactly do acquisition managers do? Where do they work? And what kind of salary can they reasonably expect to make? A common misconception about acquisition managers is that they just contract work out to vendors, according to the Intelligence and National Security Alliance (INSA)’s “Acquisition Management” page. What they actually do is collaborate with private sector companies and innovators on mission-critical tasks that promote our nation’s defense and infrastructure. The authority to make procurement decisions is the primary purpose of the acquisition management field. Managers who procure new technology, commercial materials, supplies, and services need to ensure and maintain effective competition, establish partnerships through mutually beneficial business relationships, and safeguard health and safety issues that come up along the way. The Department of Energy employs acquisition managers to facilitate a large number of procurement operations. According to its website, “The department expends approximately 90% of its budget through a variety of contracts and financial assistance agreements making it one of the largest civilian departments in the federal government. 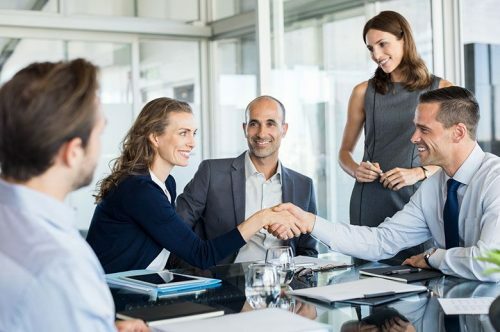 Considering the number of government agencies and large, international organizations in the world today, the demand for well-trained, skilled acquisitions managers becomes obvious. Organizations constantly need to procure goods, services, and research from countless private companies and industry-leading innovators. Latetia Henderson is the current Transportation Security Administration (TSA) assistant administrator for the Office of Acquisition Program Management. She presides over 170 acquisition and contracting professionals who, in turn, are responsible for procuring goods and services valued at more than $3 billion annually, according to her profile on TSA.gov. Henderson began her career with an undergraduate degree in sociology (per her LinkedIn profile). She first worked as an intern for the Naval Air Systems Command Contract Specialist Program, where she gained experience in the acquisition of military equipment for the Tomahawk Baseline Improvement Program. Before joining the TSA, Henderson also worked for the Federal Aviation Administration, Department of the Interior, and the Department of Defense. Henderson’s career provides a glimpse into the types of jobs that are available to acquisition management professionals. The career path she took also provides a great example to aspiring acquisition managers looking for ways to achieve their goals. A variety of avenues can lead to positions in the acquisition management field. Degrees in safety, security, and emergency management, logistics and supply chain operations, and business administration provide a good starting point. Many in the field started their careers with these or similar diplomas, according to Study.com’s Acquisition Management page. Students should be aware, though, that some degrees are more suitable to procurement careers in private industry. A degree in emergency management, security, and occupational safety may be a better starting point for those aiming to work in acquisition management for government agencies. The Bureau of Labor Statistics reports that purchasing managers, buyers, and agents earn an average of $66,610 per year. This statistic, however, does not differentiate between private- and public-sector employment. Heads of acquisition management departments in government agencies can expect to make substantially more. Earning an online MSSSEM degree from Eastern Kentucky University can help launch a rewarding career in acquisition management. Because the program leans heavily toward the government side of the emergency management and occupational safety industry, graduates should be able to enter the job market with a firm grasp of the duties and skills associated with government work. EKU offers classes in security management, homeland security, industrial safety, crisis response, fire safety, intelligence analysis, and online health and safety courses. Students can choose from 3 MSSSEM concentrations: Occupational safety, emergency management, and homeland security. Our fully accredited online emergency management degree program prepares students to sit for their Associate Safety and Health Manager (ASHM) certification and the Certified Safety and Health Manager (CSHM) exam. Those interested in learning more about EKU’s MSSSEM program should visit the program webpage today.